Come down to the Old Town Shop this Thursday June 21, 2018 from 5:00 to 7:00 to meet Stephen Ryan, the author of “The Madonna Files”. You can pick up a copy of the book, chat with the author, and enjoy some snacks and refreshments! That there exists a Marian prophecy that holds the secret of America’s future? That this Catholic Prophecy is revealing itself in America right now. 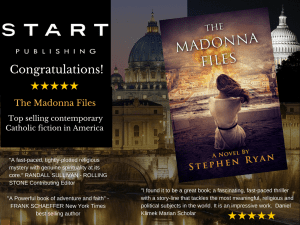 Stephen Ryan’s Vatican thriller The Madonna Files, described by New York Times bestselling author and Pulitzer Prize nominee Randall Sullivan as “A fast-paced, tightly-plotted political thriller with genuine spirituality at its core, may change the way you think of the Catholic Church forever. “I could not put this book down. It’s written in a style, with short chapters, that begs you to read “just a little more!” If you have ever read any of Joel Rosenberg’s novels, you MIGHT enjoy this book. I say “might” because this is end times from a Catholic perspective: just as Joel Rosenberg writes from an evangelical perspective that forces me to gloss over some descriptions, “The Madonna Files” has a Catholic perspective that many evangelicals will find offensive. Yet, it’s these very things that might be offensive that must be considered. 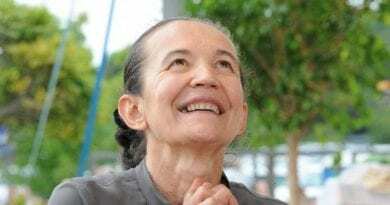 One thing the book does is tied together Marian apparitions around the world, where Mary pleaded with people to pray and do penance to return to God, or there would be chastisements. 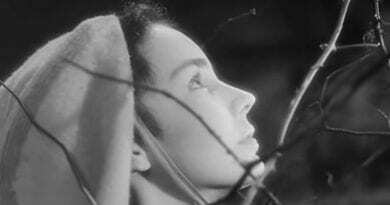 Going from the genocide in Rwanda (where Mary had appeared 10 years earlier with warnings about rivers of blood) to Fatima in 1917 (where Mary warned if we did not repent and pray another, more devastating war would break out) to the Tilma of Our Lady of Guadalupe, where an image “painted by God”, gave a direction and hope for both the Spanish colonizers and the natives. 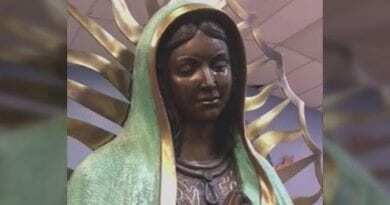 In the image of Guadalupe, we see a mestizo woman, one who is both Spanish and Mexican. It showed that these two groups should join together in peace. This peace lasted for almost 300 years, in Central and South America, until the Freemasons came to power in the region. In the lands of Protestant America, though, such a message was rejected as “Mariolatry”. Slavery was embraced and the Native American populations were wiped out. Ultimately, this Protestant rejection of respecting other races came to a head when Texas, having been settled by Protestants, rebelled against the Catholic government of Mexico in 1836 in order to allow the settlers to keep their slaves. A case is made in the book that this ultimately sparked the Civil War as a chastisement against the USA. 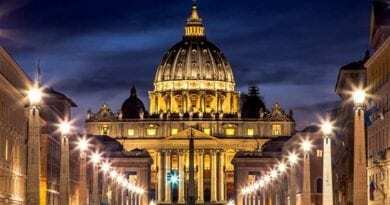 “The Madonna Files” are a collection of documents (including a letter stolen from the Pope’s apartment) that many in the hierarchy of the Church believe hold the key to the future of the Church — something so important that one faction decides it’s worth killing for. Father Dan Baronowski has been tasked by representatives of the Pope to find these documents and return them to Rome. Helped by his friend and former fiancee Rene Esterbrook (a history professor at Georgetown University) they decode the last of the clues, but not before they are on the run, pursued by a Russian hit man. The contents of the Files may provide the information needed to prevent a war breaking out with Russia, if they can survive and get the Madonna Files to the right people in time.